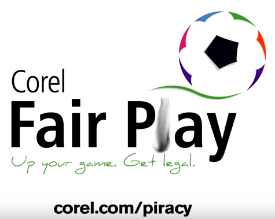 Earlier this year, Corel obtained a patent which enables the company to offer software pirates an amnesty deal via a messaging system. While this can be a smart approach, it is not without its flaws. This week, the company remotely disabled the software of a fully-licensed user of Paintshop Pro and left his medical-related business unable to meet customer needs. While the majority of computing devices come with sophisticated operating systems installed, users will almost certainly need to buy additional software to meet their needs. Open Source software can usually be obtained for free but millions of users opt for paid products that need to be licensed by the companies offering them. Of course, piracy is a significant problem for the developers behind the majority of premium products. Most are available from torrent sites or file-hosting platforms, often arriving with a ‘crack’ that allows users to enjoy without paying. Companies often have sophisticated systems to detect unlicensed products, sometimes with the reasonable aim of attempting to convert pirates into paying consumers. 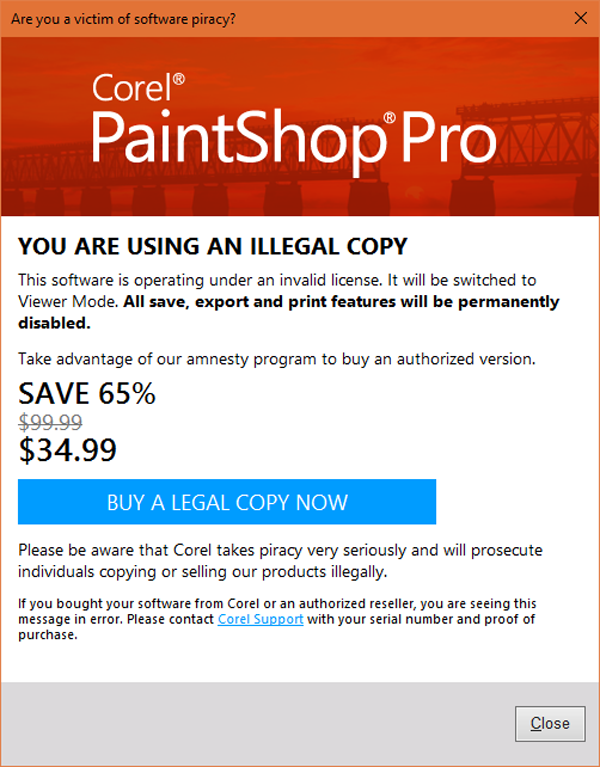 Earlier this year we reported on Corel’s efforts in this space after the company obtained a patent for a system which is able to offer an amnesty to illegal users via a popup. “The amnesty offer may, for example, agree not to bring criminal charges in exchange for the user purchasing a legitimate copy of the product,” Corel’s patent reads. While this is fair enough, what happens when it all goes wrong? Earlier this week, TorrentFreak was contacted by an angry Corel customer who was witnessing first hand what can happen when a piracy detection system blows a fuse. “I am a valid and licensed user and Corel support has records of my license key and right to use this software on my work PC,” he told us. Despite paying the company as required, he received the following popup instead. The message couldn’t be more clear. Corel states that the copy in use is illegal and as a result, its functionality has been severely limited. “All save, export and print features will be permanently disabled,” it warns. According to Corel, all of these problems can be solved with a click of the blue “BUY A LEGAL COPY NOW” button, something that made our contact extremely angry. “I get this extortion popup and threat to my means to make a living. I feel like Corel has hijacked my computer, my artwork and images and is preventing me from making a living just to sell another upgrade. This is wrong, and something needs to be done about his practice,” he told us. It’s not surprising that the user was upset at Corel remotely disabling his software. Aside from having a valid license, his work ground to a halt. Initial emails back and forth had him messing around in his computer’s registry in an effort to fix the problem but all the time he was unable to carry on with his job. “I have owned a licensed copy of Corel PrintShop Pro since 9/2016 and use it multiple times each day for work. I use it for editing and creating graphics and logos for customers that host events and in the medical field for patient wristbands at hospitals and clinics,” he told TF. Eventually, after lengthy email exchanges, the problem got fixed, albeit after Corel’s customer had been unable to use his software for an extended period. He says that the problem has left a bad taste in his mouth and wonders how many other people are getting the message and, crucially, whether less technical users are paying to have the anti-piracy message removed. “I’m not sure how [the steps Corel took] corrected my license issue or if it just took me off the ‘hit list’ of victims of what I still feel was some kind of scam. Still no apology from Corel for the problems caused or the delays it forced on me,” he added. TorrentFreak contacted Corel requesting information and received a response from Gerard Metrailler, EVP of Global Products, whose name is on the patent issued earlier this year. “Our anti-piracy measures are designed specifically to protect our IP. And as part of this process, we offer an amnesty program on many of our products that gives users an easy way to purchase a legitimate version of our software at an affordable price,” Metrailler explained. “Unfortunately, some users who believe they are running legitimate versions of our software are surprised to receive a notification that their license is invalid. In many of these cases, the products were purchased from online marketplaces, often at very low prices, and the users were not aware they were buying illegitimate software. “It’s critical to note that customers should always purchase our software from authorized resellers or Corel directly,” he added. Given comments on Corel’s forums about unlicensed resellers, early in the week TF checked with the user where he’d obtained his license. According to an original purchase receipt reviewed by TF, it was obtained from the company’s own online store and everything was in order. Corel did, however, suggest that a customer could receive the anti-piracy warning in error and said any customers who believe they are affected should contact the company right away. “[I]n the very rare event of a mis-identification, I can assure you that we will work quickly to get the issue corrected. We agree that even one customer affected by a mistake like this is one customer too many,” Metrailler said. We asked Corel how many customers take them up on their offer of reduced price software as part of an amnesty but the company provided no details. We asked if there were any safeguards to prevent licensed users paying up in error but received no response. Corel did, however, give TF a contact email address so that their customer can get directly in touch, and we’ve forwarded that to him. In the meantime, directly with the customer and independently of our discussions with him and the company, Corel support offered him a 5% discount on future purchases. “I want to ask them if that 5% is good for Photoshop,” the customer commented dryly.